Gemstone cross pendants hang from a 20 inch sterling silver chain embellished with garnet, citrine and tourmaline gemstone nuggets. Cross measures approximately 1 inch high x .75 inches wide. This beautiful piece is handmade by jewelry artist, Laura Ramirez. It will look beautiful with anything you wear. 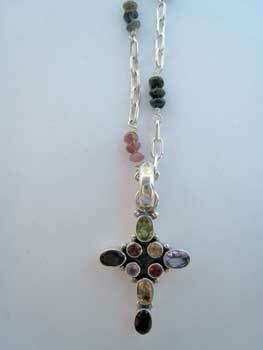 There are only two gemstone cross pendants available. Order yours today or give it as a gift to your favorite person!